Amino AcidsFOURPLUS 4+ BCAA+ 2:1:1 - 125 tabl. Extreme dose - up to 6000mg the purest crystalline BCAA in each serving - an absolute record! In addition, great taste and good solubility enjoyable supplementation! Bet on the quality! FOURPLUS 4+ BCAA+ 2:1:1 - 125 tabl. High-quality formulation based on branched chain amino acids, enriched with vitamins B6 and B1. Indicated as an adjunct to diet athletes who run intensive training! 59 loyalty points Your cart will total 59 points that can be converted into a voucher of 2,36 PLN. FOURPLUS 4+ BCAA+ 2:1:1 - 250 tabl. 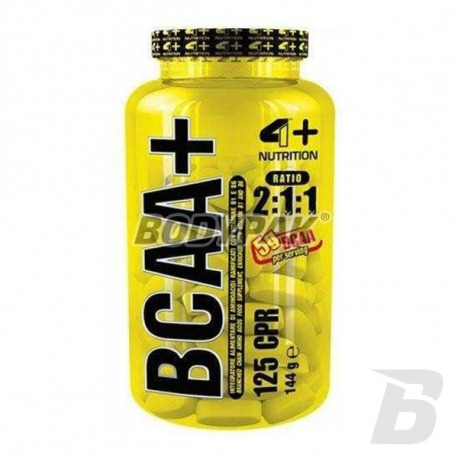 FOURPLUS 4+ BCAA+ 2:1:1 - 500 tabl. 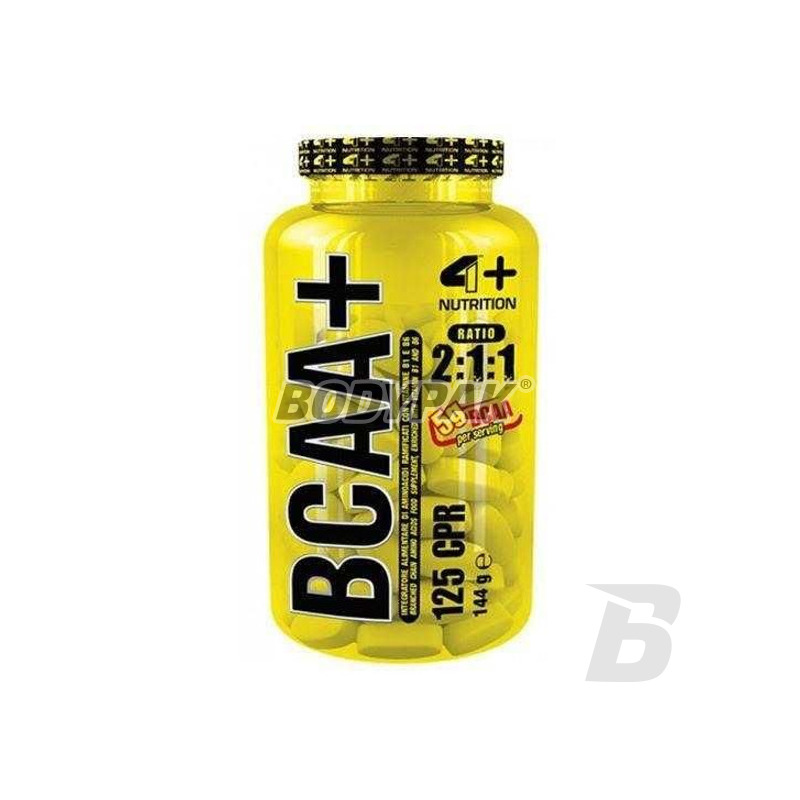 4+ BCAA+ is a dietary supplement made on the basis of branched chain amino acids, enriched with vitamins B6 and B1. Indicated as an adjunct to diet athletes who run intensive training. BCAA branched amino acids make up more than 30% of lean muscle mass. Intense training leads to the exhaustion of energy reserves, as well as the reduction of branched chain amino acids. Reducing BCAA limits the process for the synthesis of proteins, which in turn leads to a decrease in efficiency of the body tissue and reduce mięśniowej.Aby block the appearance of adverse catabolic state and to increase muscle protein reconstruction should provide branched chain amino acids. 4+ BCAA+ also indirectly affects the secretion of growth hormone and insulin - very strong anabolic hormone. It is designed to support the effort in all sports with a high-intensity workout. It enhances the growth of muscle mass and strength and increase physical fitness. Składniki: L-leucyna, L-izoleucyna, L-walina, substancja wypełniająca (celuloza mikrokrystaliczna), substancje przeciwzbrylające (dwutlenek krzemu, sole magnezowe kwasów tłuszczowych), witamina B6 (chlorowodorek pirydoksyny), witamina B1 (cyjanokobalamina). Olimp Musclemino Stage 1 - 300 tabl. Sensational pre-training preparation, the composition of which is based on a selection of specially selected portions of specific amino acids! Excellent choice for use before and during training. A positive effect on physical fitness and helps dismiss fatigue! Reduces the negative effects of catabolism. Swanson AjiPure 9 Essential Aminos Formula - 60 kaps. Trec AminoMax 6800 - 160 kaps. Advanced matrix branched chain amino acids in a ratio of 2: 1: 1 L-leucine: L-isoleucine: L-valine. Thanks to high-end manufacturing technologies product has a much better solubility! Bet on the quality! High-quality preparation, which contributes to faster recovery, support anabolism and catabolism protection! It tastes great and well taken! The formula is based on the classic proportions of 2: 1: 1 and the addition of essential vitamins. Concentrated source of branched chain amino acids. Branched chain amino acids build approx. 1/3 of skeletal muscle mass, they have anticatabolic effect, and play an important role in muscle protein synthesis. TERRIFIC FORM SHOT!